For our February meeting we would ask members whose last names begin with M and N to bring snacks. It’s the “Ugly Fabric” auction and we anticipate a good member turnout, so we ask that snacks be generous. Thank you! Despite the weather, January member demos were appreciated by those attending and great tips and ideas passed along! Join us for this fun filled Fabric Event during our February 20th Guild Meeting. If you have a piece made from last year’s auction fabric, bring it in! A last year’s ‘Ugly’ bundle transformed into a Comfort Quilt by Patricia Loquet! 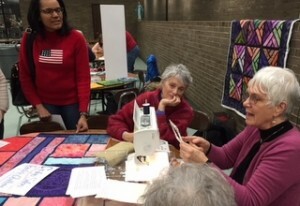 Every year the Guild supports a nonprofit charity organization to partner with the Guild and be the recipient of our Raffle Quilt fundraiser. If you have a favorite charity that you would like to nominate, the nomination form, guidelines and timeline can be found on the website under Charitable Activities. Applications are now being received by althea nolan, charitable@northernstarquilters.com. The ultimate deadline is the March guild meeting. Still openings in Julie Neu’s workshop – Creative Play – March 21 – sign up now. Are you in need of a day off? Do you even remember the last time you played? 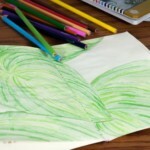 In this workshop you’ll play in a variety of art mediums (paint, colored pencils, collage, etc.) to help rediscover your creative fire. 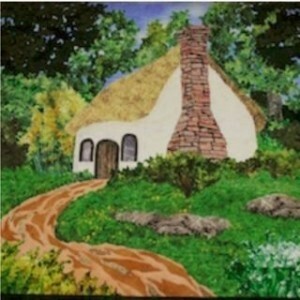 At the same time, you’ll learn about the creative process and gain techniques you can take back into your regular quilting practice. No prep work necessary, just show up ready to play! All levels. 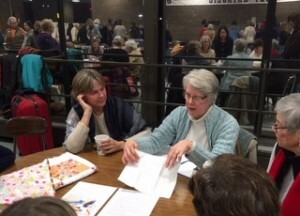 Art Quilters SIG – meeting at 5:45 before the guild meeting. Bring a man- made object to share if you did not do that last month. IMProV Sig – meeting at the back of the cafeteria. I’ll demo the “Skinny strip”. Newcomers always welcome! 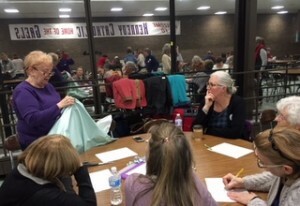 Longarm SIG – meeting on Feb 3rd at the home of Lorraine Freed. 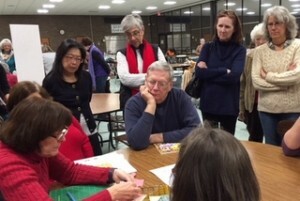 Landscape SIG – meeting on February 24th from 1pm to 3pm at the FABRIC MART quilt shop in Yorktown. EQ SIG – meeting at 5:45 in the cafeteria. If you aren’t a member, but would like to see what it’s all about, come and join us. 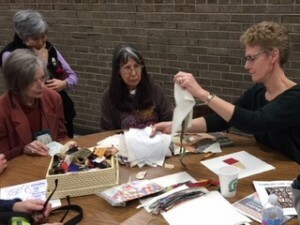 Paper Piecing Sig – meeting on February 14th 10-1pm at the FABRIC MART quilt shop in Yorktown. 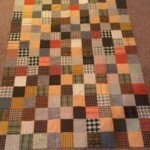 Don Gough is teaching a Pictorial Quilt class on Saturday March 10, 12-4pm at Fabric Mart, Yorktown. He covers all the tips, tricks, and techniques you need to know, no equipment necessary. Open to all, $20, call Fabric Mart to register, (914)-962-3328. Don’t forget to check the lower section of our home page to keep up with local events and awards pertaining to our members!